Today, we are going to learn How to make a box with arrow in CSS like chat application. If you have used Facebook and Google chat applications, you may have been observed arrow pointed head at left and right of the div. Lets check the below screenshot, in case you haven't observed. 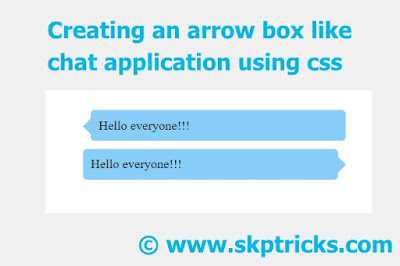 Add the below HTML and CSS code, that helps you to design arrow box like chat application using css. This is all about Creating box having pointed arrow using CSS. Hope you like this simple example. Thank you for reading this article, and if you have any problem, have a another better useful solution about this article, please write message in the comment section.